This area is consisted by one and only village, the Ιnoussa, which is built around the port. It is located on the southern coast of the island, covers a total area of 14 square kilometers and has a population that reaches 1000 permanent residents, a number that rises during the summer. Administrative, it belongs to the Region of North Aegean Sea, in the Prefecture of Chios. Ιnoussa, is a classic Aegean resort which overlooks the island of Chios. Surprisingly larger in size compared to the size of the whole island, it still remains a traditional village, not corrupted at all by modern interventional facilities as seen in other island of the Aegean. Entering Innoussa village, the visitor will firstly meet the port of Ιnoussa, where stands proud the “Statue of Oinoussiotissa” (which is the Greek word for the local woman of Ιnousses), a bronze mermaid wearing a crown and holding a sailing boat on her left hand. This statue is a symbol of the local naval tradition and offers the visitor a first idea of what he will see during his stay on the island. The “Square of Seamanship”, the monument of the “Unknown Sailor”, the Maritime Museum and the Marine Schools are also bond to attract your attention and demonstrate the importance of shipping for the region. The pearl of the town of Ιnoussa is the church of Saint Nicholas, which you can find in the center of the town. 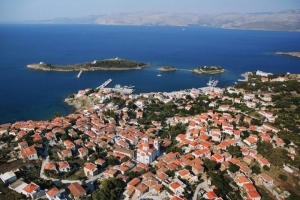 Ιnoussa is the birthplace of many ship-owners after whom the streets and squares of the area have taken their names, further strengthening this way the maritime character of the island. Take your coffee at the port and admire the Statue of Ιnoussiotissa which will take you back in memories of the island’s glorious maritime past.